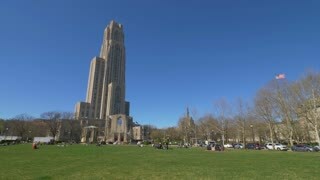 Search Results for "cathedral of learning"
PITTSBURGH, PA - Circa May, 2015 - An establishing shot of the campus of CMU with the Cathedral of Learning seen in the background. An early morning establishing shot of two bicyclists riding on the Hot Metal Street Bridge in Pittsburgh's South Side district. Pitt's Cathedral of Learning is in the distance. PITTSBURGH, PA - Circa May, 2015 - An establishing shot of the Cathedral of Learning as seen from the Carnegie Mellon University campus. A high angle profile establishing shot view of Pittsburgh's tech corridor along I-376 with the Oakland skyline and PITT's Cathedral of Learning in the distance. 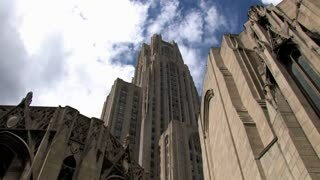 A slow tracking dolly establishing shot of the top of the Cathedral of Learning building in Pittsburgh's Oakland district. PITTSBURGH - Circa April, 2017 - A daytime establishing shot of the Cathedral of Learning on Pitt's campus on a sunny early Spring day. PITTSBURGH, PA - Circa May, 2015 - The Cathedral of Learning as seen through the trees on the streets of Oakland. Ascending aerial shot, of the Cathedral of Learning in Pittsburgh. Ascending aerial backwards shot, revealing the skyline of Pittsburgh and the cathedral of learning .